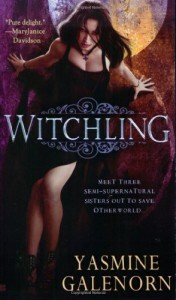 Witchling by Yasmine Galenorn:The Particulars: Urban Fantasy, Berkley, available in print and as e-book The Source: The bookshelf The Grade: B¨The Review:One of my reading challenges this year is to re-read the Otherworld series by Yasmine Galenorn, originally the plan was to re-read it before Shadow Rising was out in February, but obviously that didn't happen. That said, I am glad that I made that vow, since I enjoyed this book a lot. The world was rich, and intriguing. I loved the twists on the myths and standard tropes that was revealed, and in some cases hinted at. I also liked the impact the Sidhe had on humans, that some loves them and some hates them. Which makes totally sense. But more than the world, I loved meeting the characters. I loved Camille. Her struggle with her feelings to the Svartan Trillian, who showed up without warning. Her love to her sisters. Her courage, and determination to do what is right. The plot was fast paced, yet it felt as if it wasn't too fast. It was easy to understand the characters reactions and actions. I loved how Camille's Magic affected the plot. Not that it made it easier, if anything it made it harder. So what I didn't like with this book. It took a long time before it sucked me in, before it hooked me. In fact, it wasn't until page 150 or so that I felt the urge to just keep on reading. Before that I put it down and picked it up several time. Interstingly I have had different reactions each time I have read this book. The first time, I felt it was good, but not great , the second I loved it. This time it was a mix of the previous times.